For today’s 1930s paper doll dresses the “thing” I wanted to draw were those sleeves on the dress on the left. That dress is from a McCall 7209, copyrighted in 1932. You can see similar sleeves in McCall 8371 and McCall 8599 from 1935 or Simplicity 1325 from 1933. The sleeve details of the 1930s foreshadow the broad-shouldered silhouette that will become popular at the end of the decade and then take over in the 1940s. 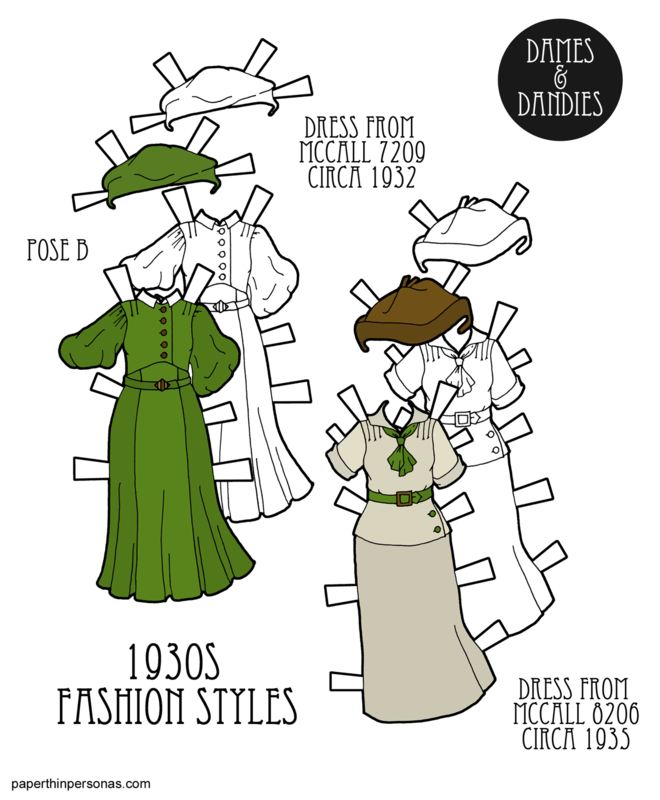 The other of the 1930s paper doll dresses is the one on the right with the scarf. That’s from McCall 8206 and is copyrighted 1935. It’s a more subdued dress and closer to what I think of when I think of the 1930s. The skirt drops quickly from the late 1920s when it’s just below the knee to mid-calve by the early 1930s. The two hats are based on a soft folded felt hats that were common in this era. I didn’t have a specific example I was copying, but heres a few from a pattern cover and one at the LACMA museum. More examples of 1930s clothing can be seen on my 1930s Fashion Pinterest board. I tried to pick colors schemes that coordinated for these, so that the hats could be worn with either dress. If you’re thinking, but there’s no paper doll with historic underwear to go with these dresses, fear not. I have a 1930s Benedita in the works to accompany today’s gowns, but until she’s done any of the B Pose dolls can share these dresses. Meanwhile, there’s an alternative color scheme on the Patreon page from my Patrons- donate and join if you’d like to support the blog. Now, would be a smart time to join, because I am currently doing my annual “Make requests” poll for my Patrons. If you’ve ever wanted to see a ballerina pirate paper doll dress, now would be the time to ask. I love these! thanks, the dolls are grateful. It’s been okay here, but north and east of here they are getting like baseball sized hail, which is just wrong. So, I’m very grateful to be safe.